Look Fantastic Limited Edition Chinese New Year Box Available Now + Full Spoilers! Celebrate the Year of the Pig with our Chinese New Year Limited Edition Beauty Box! 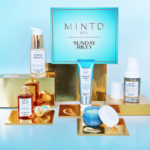 The Chinese New Year Beauty Box is finally here, offering eight different hero skincare and cosmetic products, perfect for gifting and trying out the best-selling products you’ve always wanted! Breathe new life into tired skin with this revitalizing boost of liquid oxygen. In the form of a cooling and soothing gel, this infuses the skin with oxygen molecules, leaving skin nourished and hydrated. Leaving skin smooth and plump, the Oxygen Booster resurfaces wrinkles and smooths the skin. Create a healthy-looking complexion with a flush of color from this Illamasqua Powder Blusher. A buildable neutral shade of pink, this blusher adds a wash of color, helping to awaken the face. Use a damp brush for a more intense color pop. Deeply hydrate dry skin with this intensely moisturizing mask. Designed to provide immediate comfort to dull and tired skin, this mask visibly reduces any tight or lackluster skin. Containing a blend of hyaluronic acid and moisturizing sugars, this mask creates a protective barrier that prevents further dehydration. Designed to revive color-treated hair, this shampoo gently cleanses hair to protect and maintain colored hair. This nourishing shampoo utilizes Système Capture Advanced to neutralize environmental aggressors, preventing colored hair from fading Leaving hair soft and supple, enjoy reflective hair with vibrant shine. Promoting a smooth, healthy-looking complexion, the moisturizer absorbs quickly into skin; it strikes the perfect balance between hydration and sebum regulation to control shine and help prevent blemishes. So disappointed in this shampoo! I was excited to try it because the ingredients on the product page did not indicate sodium laurel sulfate. The container, however, does list it. Thank you ladies for finding the 20% off code & calculating the value for this set! Thank you to all the fine ladies for sharing all the good deets, cannot pass this up! Thanks for doing my homework for me. I really appreciate it. I love to know the value before I buy. I really want to try the shampoo and the oxygen booster so I got one. Thank you for posting the code. It was a big help! Thanks for doing my homework for me. You’re the best for posting that. You are all quite welcome. If a 25% off coupon comes out I might cave, but I have WAY too many beauty products after the holidays. Gifts galore. The Water bottle is like a 16.9oz generic S’Well bottle with LF branding. I haven’t used mine yet, but it looks nice. Thanks! I was considering the box until I saw the price. I’m not familiar with any of those brands/products. Pooh….still too pricey for me…but Omororicza and a few of the other products would be fab to get! !